Update: Surgery went off without a hitch, and I was sent home that very evening. Except for a day's worth of nausea from the anesthesia, everything was fine until early Christmas morning. Apparently my heart decided things were boring and went dancing off on a rhythm all its own. Yes, I had a very stubborn case of atrial fib. that didn't resolve despite the Urgent Care team's best efforts until I got back home. That meant yet another trip back to the hospital to make sure that said heart really was behaving, and now I'm happily on the mend. Hallelujah! So, we had our Christmas feast yesterday in the true spirit of Boxing Day. And then we learned that it really was an historic day. David lost his first tooth! We were a witness to the new gap, thanks to Skype, and all I can think is, "How did this child get to be almost six already?" Here's a photo of the DD#1's whole family, enjoying the snow at Lake Geneva. All that snow makes me shiver! It's a good thing I finished this little sweater since it seems to fit just perfectly at the moment. Only a couple of knitting projects haven't been shared. This scarf is made from Trendsetter's Soleil yarn and was FUN to knit. I tried the same pattern (Yarn Harlot's One Row Handspun Scarf)in Cleckheaton with equally good results. I love this pattern and am so grateful to have found it on Stitches of Violet's blog. It is so easy and looks great in any yarn! Having observed David's teacher standing outside daily to help the children find their parent's cars, I decided that she needed a hat to survive the Chicago winter. I well remember playground duty days with a lot of sympathy! What have I been up to this month? Not a whole lot. At the moment I'm trying hard to wait for gall bladder surgery without going nuts. It's scheduled for this Wednesday, which is rotten timing, but we did get to sing in the choir concert last Sunday, the gifts have all been mailed, the cards almost done, and I've been working on the Advent Calendar scarf which is guaranteed to keep one's mind (and fingers) occupied. (See the sidebar for the link. Almost all of the days are there, and you can join me in being behind!) 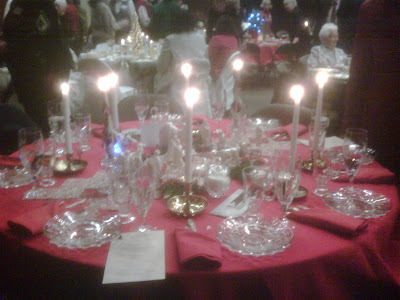 Fortunately I was able to help decorate a table for our Christmas Dessert event at church. It's always a fun way to begin the holiday season and time out from the hustle and bustle to focus on the real reason for celebration. This is a dark and rainy month for us in the Northwest. Even the cats are noticing. The "Register Wars" are in full force. We haven't figured out why this is the favored register, but it's almost always occupied by one or the other of our furry felines. Lots of projects have been finished. I made a another companion for Mr. Popper. A cardinal is awaiting another wing; maybe that'll happen tomorrow. Lots of knitting happened during our Thanksgiving trip. The Mystery Socks are finally finished. I just love the yarn color, hydrangea, and unfortunately it's no longer available. Sophia's sweater is complete and fits. Hurrah. David requested a "Ginger Hat" when he saw the "Mocha Hat" I made last fall. It's kind of big, but he deemed it "perfect" which makes this Oma very happy. We must have mailed our packages too soon because some have already been opened, but that means I can share them. That'll be another post because my scarf is calling. I'm only just starting Day 6, and this is day 19. Yikes! We set off for California last week in what became a big snowfall in Seattle that cancelled school and delayed traffic for hours. Luckily we outran most of the snow as we left early in the dark before things got too interesting. Even so, we had snow almost to the WA/OR border and were glad we had already decided to cut over to the coast at Eugene. 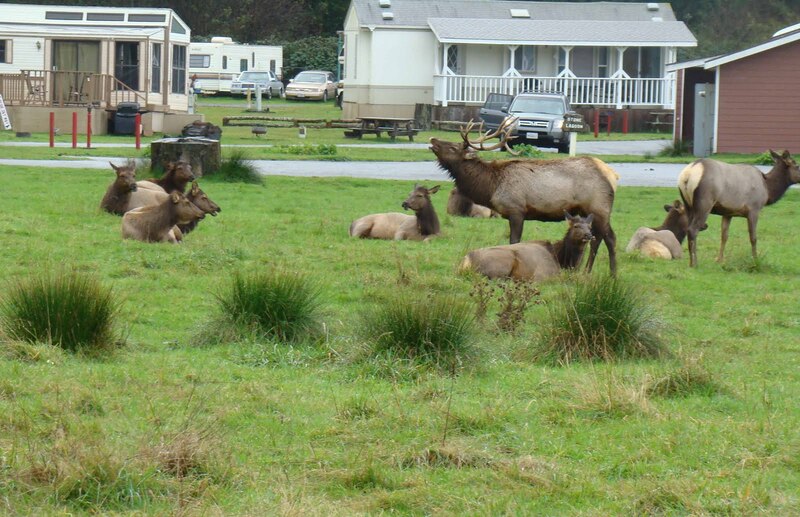 Besides being a last minute way to avoid the snowy mountain passes in the Siskyous, that road is a great place to see elk. We weren't disappointed. The coastal route is slow but beautiful. As you can see, it wasn't clear and sunny there either! The highway goes quickly from 4 lanes down to 2 in spots where it wends its way through the giant redwoods. We had never seen this place before. Can you imagine living there? Our destination was San Luis Obispo and the memorial service for our friends' dad. He was a professor at Cal Poly and a very nice man. Following the service, we joined the family for their traditional Thanksgiving celebration; we made the total attendees, 30! It was great fun to reacquaint ourselves with all the family members, including grandhildren we'd never met. All too soon it was time to head north. We again decided to travel on 101 and were glad we did. With all the rain on the coast, the mountains more than likely were difficult driving. Even though it was Black Friday, we had no problem getting through San Francisco and across the Golden Gate Bridge. We "hurried" home but managed to see a few interesting things on the way. At one place we stopped for lunch, we saw lots of white cranes in an adjacent field. Since this is the beginning of the holiday season, we took a mistletoe picture. This holiday symbol is actually a parasite that is spread by the birds and seems, at least in California, to prefer the liveoak trees. At the Ca/OR border we saw a huge herd of elk. I'm not sure what this guy is saying, but it must have been important! Do you have any idea how much knitting can be completed in 2400 miles? I can't share that yet though because most of it's holiday related; you'll just have to take my word for it. The snow was gone when we got home, but we returned with many pleasant memories of a Thanksgiving that was both joyous and just a little bit sad. It was definitely a memorable trip.